It was a new experience for me to be a “judge” trying many different products including lots of Chocolates but someone has to do it! The products are numbered and the team of judges are provided with a “Briefing Sheet” which outlines the Award Category entered, Price and weight per pack, Ingredients, Nutritional details and Allergen information. They were all removed from their packaging so no indication of the brand, product name or manufacturer: so we are tasting blindly, with lots of water provided to clean the palate. With some of the entries, the Manufacturers specifically provided a recipe to make the product (specifically with Store Cupboard entries) which in some cases, made it a challenge to compare and contrast as their entry was one ingredient in a final product, and with several allergies, some of the products I could not try (such as those including egg yolk) but with a good circle of judges, “no-scores” are recorded so it does not have an impact on the result. Once, we have individually tasted, rated and commented on the entries, a tally is made and an active discussion occurs. It was interesting to listen to the different perspectives that the judges all bring to the table: some with detailed nutritional knowledge who can advise whether the entry is good for the body or the soul, some food professionals provide a comprehensive background as to how hard it is to achieve a certain taste or manufacture the entry versus other food bloggers who can advise whether this is widely available or not (as the case is often!). After a shortlist is compiled, further discussion is prompted by the packaging /design /branding, once it is revealed whom made the item, with a strong emphasis on labelling. It surprised me how mis-understood and confused some of the labels were by several Manufacturers but then some of these are NEW and INNOVATIVE and breaking-new-ground. From my various posts, you’ll know I loved trying, tasting and commenting in the Desserts and Puddings category and even more; Confectionery & Chocolate! I loved the wide selection of entries with many differently flavoured Chocolate bars (some Dairy Free, some Lactose Free and some taste-free)! And the wide variety of products now available for the Coeliac. More Chocolate & Confectionery Tastings! It’s a hard job but someone has to do it! Thanks to Michelle Berriedale-Johnson for capturing me eating a DAIRY FREE and GLUTEN FREE Dessert! What an attractive picture from her blog! Enjoying my DAIRY FREE and GLUTEN FREE Dessert! For other shortlisted products (including Breakfast Foods, Breads, SuperFoods, Food to go, Down the Pub & Bar et al And further information on the Free From Food Awards, see their website. After the winners have been announced, I will share further information, noticeable trends and some specific product reviews on some of the award-winning products. If you are a member of Coeliac UK, they produce a comprehensive directory which covers over 16,000 food and drink items (including GLUTEN FREE Chocolate Bars). This is available in a paper-based Manual and online FREE to members of Coeliac UK. One of the hard-hitting posters (featuring Yours Truly) from Coeliac UK launched for Awareness Week, held earlier in 2015. And to be seen in 2016. SIGN UP so you do not miss out on further updates to the Chocolate Bar listing (My TOP post) as well as new Restaurant Reviews, Travelling experiences, Food Shows, Product Reviews and (occasional) Recipes. Also check out my posts on GLUTEN FREE Ice Cream, GLUTEN FREE Advent Calendars, GLUTEN FREE Mince Pies, GLUTEN FREE Easter Eggs and GLUTEN FREE Valentines Treats. 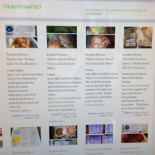 This entry was posted on February 24, 2016 by glutenfreepsd in News & Views, Product Review: and tagged Award winning Chocolate, FoodsMatter, Free From Food judging, FreeFrom Food awards, Gluten Free Chocolate, Gluten Free Confectionery, Gluten Free Desserts, Gluten Free Pudding, Store Cupboard.